Indian cricket team captain Virat Kohli is breaking batting records at will. Virat Kohli's century against the Windies on Sunday was his 36th ODI ton. Virat Kohli scored 140 runs hitting 21 fours and 2 sixes in India's 8-wicket win over the Windies. If he continues such imperious form, he may well surpass most of the legends the game has produced. Virat Kohli is now only 81 runs short of completing 10,000 ODI runs and once he achieves this feat, he will become the fastest to 10,000 ODI runs in terms of innings. 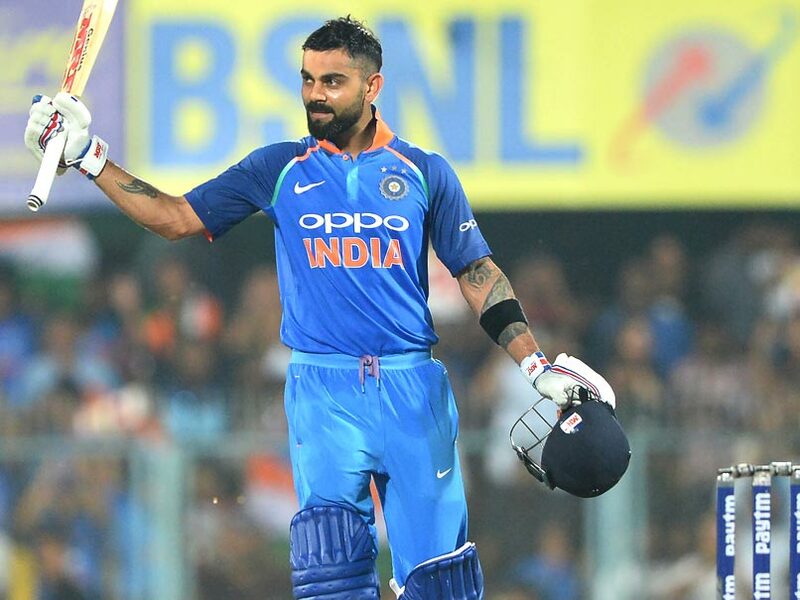 The current record is held by batting legend Sachin Tendulkar, who took 259 innings and it seems Kohli is very much in the scheme of things to overtake him in the ongoing Windies tour itself. Kohli has played 204 innings so far and if he achieves this, he will become the 5th Indian to reach the 10,000-run mark in ODIs. Kohli is already having a breathtaking 2018 in terms of runs. With 889 ODI runs, Kohli might not be the top run-getter this year but he has taken just 10 matches reach there. The Indian captain currently sits in fourth place in the ODI scoring charts in 2018. England trio of Jonny Bairstow, Joe Root and Jason Roy have all scored more ODI runs than Kohli this year but the difference in averages are eye-popping. While Kohli has scored 889 runs in 10 ODIs at an average of 127, Bairstow, who tops the list, has taken 22 matches to score 1,025 runs and averages 46.59. Kohli has four centuries and three fifties to his name this year. If he continues his form with the bat, India will definitely be hot favourites in next year's World Cup in England and Wales.